We are excited to announce big upgrades to our men’s and women’s Gold Level Nordic Race Suits and Jackets this season. Once again, Podiumwear has teamed up with Olympic Gold Medalist Jessie Diggins on the design of these products. “Jessie’s input and feedback has been integral," said Product Developer Kristine Larsen. “We are so excited about all the changes, which really revolutionize these cornerstone Podiumwear products.” In addition, Diggins specifically asked that we make a hat with a pompom as well as the cozy post-race pullover that we’ve named the Afton Pullover after Jessie’s home town here in Minnesota. 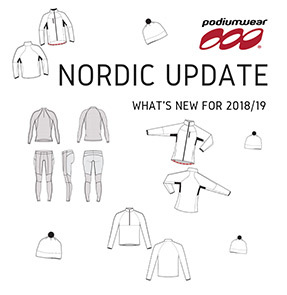 All of these products and more are available now on the Podiumwear Nordic Page! The redesigned Gold Jacket boasts new fabrics, a new cut and lots of technical details, that together completely revolutionize the product . A new fabric with Dintex® technology on the chest, upper sleeve and collar provides the highest possible level of breathability with an membrane to prevent water and wind from coming in. A second ultra-breathable fabric at the back and inner sleeve areas wicks moisture to the surface while a third mesh fabric allows maximum ventilation at critical underarm sweat zones. A new streamlined cut and technical details like AquaSeal® reverse coil zippers and grip band at the bottom hem make this jacket a new gold standard for teams. The men’s and women’s Gold Level Race Suit also has new fabrics: the first is lighter-weight micro-grid Poly-Spandex blend with amazing wicking ability; the second (used on the hip and thigh panels) is a more durable Velcro-resistant fabric with a cozy, brushed interior. Both fabrics hold color incredibly well so your team’s design will remain vivid no matter how much you stretch it. We’ve added even more panels -a whopping 33 on the men’s and 34 on the women – guaranteeing that no other race suit will hug the body as well. The all-new Afton Pullover is soft casual layer that can be worn before, after and during training and racing. The micro-grid fabric wicks, has a brushed interior and is fully customizable. Just like Jessie, your team will not want to take it off. It’s the perfect layering piece and the best spirit wear your team could have. The new Pom Hat uses a tricot knit fabric with brushed interior that insulates while wicking sweat. The entire hat is customizable. The black synthetic pom is a special request from Podiumwear Ambassador Jessie Diggins.